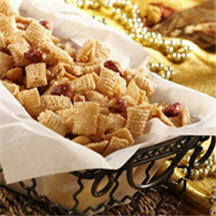 A sweet, salty and crunchy treat, this is the 'candied' version of the savory snack mix loved by millions. Heat oven to 325°F (160°C). Spray two 15x10x1-inch pans with cooking spray. In large bowl, mix all ingredients until evenly coated. Spread in pans in single layer. Bake 12 minutes. Spread on waxed paper to cool, about 15 minutes. Break into pieces. Store in airtight container. High Altitude (3500-6500 ft): Heat oven to 300°F (150°C). Bake 15 minutes, stirring every 5 minutes. Be sure to use sweetened condensed milk, not evaporated. Evaporated milk is thinner and does not contain added sugar, which is needed for this recipe. No baking pans with sides? Line 2 large cookie sheets with heavy duty foil and fold up all the edges so the mix doesn’t slide off.